To this day, huasos are known to be preferential in the type of work they do. Much like the conquistadors who started the Chilean society, they show a declared dislike for manual labor. However, unlike the gaucho that will barely contemplate stepping off his horse to do anything, the huaso has had a more varied trajectory, being of use on foot, as well as on horseback. However, he generally meets the more menial “on ground” tasks with less enthusiasm and a slower pace. It is when the huaso is challenged to put his horsemanship skills to use that one realizes his cunning and valor. Providing these services offer the greatest opportunities to proudly demonstrate he is a first-rate horse-and cattleman. Nowhere is this evidenced more than the roundups that are held in the rugged mountain terrains so widely distributed throughout Chile. These sectors are often the breeding and growing grounds for cattle left to fend for themselves until the yearly call for branding and sorting. It is here that the huaso puts all his skills to use in searching and driving the rowdy cattle that need to reach the communal pens of the hacienda. It is in the distress of the unpredictable, steep, rocky terrain that both the Chilean Horse and huaso show the self-confidence that comes from their dependence on each other. For three to seven days a week, the huaso will live an atypical life. Sleeping on his saddle blankets and saddle leathers in the open air, the huaso shifts to a drover’s (arriero) lifestyle. Living on little but a mix of toasted ground wheat, sugar and water and an occasional bite of smoked jerky (charqui), for these days his diet is reminiscent of his Mapuche ancestors at war. A hollowed-out gourd container may be among his essential utensils. This he fills with a cut, dry, grass called yerba mate before adding hot water. When it has simmered he sips through the metal straw known as a bombilla that has a metal bulb on the end that is perforated with holes. This ingenious invention strains out the native tea directly into shallow swallows of bitter tonic. They may have assured the omnipresence of Spanish names, but clearly the Native American influence is woven into the huaso culture!! Occasionally, a cup of instant coffee can be prepared in an old coffee can that has a make-shift wire handle to place and remove it between the stones on the edge of the campfire. This “choca” container is a common implement that hangs off the sides of packhorses or saddles of riders that find joy in its rhythmic melody when traveling through the mountains. This is not the normal life of the huaso, who relishes going to his adobe-wall house at the end of every day, with its clay tile roof and a yard full of children. However, when duty calls to display his talents as a horseman and cattle driver, nothing will stimulate him more than proving his worth in front of his peers. Not all huaso chores were as exciting as the roundups. Others were monotonous by definition. In the days when gentlemen would only consider riding stallions, mares were selected for a good turn of foot so that they could implement the wheat thrashing process. The wheat was distributed on a compressed floor of a circular ring. These “trilla” mares, as they were called, energetically went around and around until their continual pounding separated the grain from the hull. Later, shovelfuls of the processed wheat were thrown into the air. This rudimentary sifting process could sort out the desired grain granule that fell close by from the fibrous by-products that were blown farther downwind. 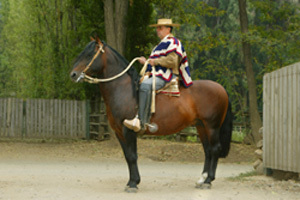 The production of trilla mares had existed in Chile since 1610. Good groups of homogenous looking mares were bred and selected for this purpose. Not only were they able to get the job done quickly for the hacienda, but also in doing so, offered the opportunity to lease out their services to other farmers who did not benefit from horses trained for this function. The need for this job assured the Chilean Horse breeders that the future broodmares would have some sort of selection as well. After all, these were the broodmares of their cowhorses. Breeding a good mare for wheat processing offered an opportunity to select for spirit, sound body and limbs, and good temperament -- all qualities that would serve the huaso in stock horse competitions as well. Nowadays, the combine has substituted the labor of the horse hoof, but most small town celebrations invariably honor this custom with “reality” examples of how the huasos made the trilla work. It is a reminder that, in Chile, the hacienda was never far from some agrarian activity that also made up part of the responsibilities of the versatile and cooperative huaso. Although huasos can have a diversity of functions on the farm or rural community, more and more, the word is beginning to define the man that drives and pins cattle in the rodeos. In this context, the huaso may not even have a rural background or profession, but if he has devoted himself wholeheartedly to the sport of the rodeo, respects its traditions, partakes in the camaraderie, and is good at “running the cattle”, he will be respected as a huaso in most circles. The sport has always had interesting combinations of huaso farm owners and huaso employees that team up for these formal competitions. Sometimes father-son combinations can also be seen. Brothers have also ridden together. Lately, however, there is a new era in the sport whereby salaried riders are being remunerated excellent salaries in order to assure the results for top-notch breeding farms. This has brought about teams of two well-respected professionals that have joined forces under the incentive of a more formal job description. With so many different regions participating in the rodeos, one would think that the huaso is a role taken on by many different races and ethnic groups. To some extent that is true, and we see Croatian, English, French, German, Greek and Italian names not only participating now, but also in the history books of this sport. However, for the most part, the huaso has been comprised of a very homogeneous type of individual. When strolling around the fairgrounds, or during nocturnal activities, the huaso is a sight for sore eyes. His erect posture denotes his self-confidence. His slow paced steps announce that this is a time for relaxation. His frequent laughter with companions points out both his sense of humor and his fidelity to friends. The courteous smiles that accompany his greetings to everyone who crosses his path attest to his sense of humility and unconditioned accessibility. Away from the rigors of competition, his hat may now be worn with a tilt to one side and his hat cord will surely be drawn tightly behind him. The fitted jacket that is hidden under the chamanto while contending on horseback is now in full view. The sash has been set aside and in its place one can observe a handcrafted, ornamental carpincho leather belt with a matching pocketknife case. The chamanto will be neatly folded over the left shoulder with the huaso’s arm tucked close to his body. His elbow will be bent at a right angle, placing his inner wrist across a trim abdomen. The full length of his pants is now visible, as he projects a statelier demeanor. With each step, his shiny boots extend beyond the pant leg with the Latin elegance that only an angled riding heel can provide. The huaso has every right to be proud of the fact that he displays such classy garb, both as a rider and as a pedestrian. However, such individualistic ideas cannot penetrate a mentality that concentrates on simply being happy for having the opportunity to do what he loves most, in the company of lifelong companions, who as a whole represent the backbone of the Chilean way of life. The huaso has every right to flaunt his costly hand-tooled tack of admirable quality and original design. However, comparing materialistic virtues is not his style. It is more likely that the huaso will expand on his appreciation of having maintained the tradition of all-leather gear, or giving public recognition to the artisans that have become synonymous with the specific objects of their trade, or boast about the number of years he has owned the equipment he zealously cares for. There is only one subject that will consistently make the huaso set his humility aside. That would be in describing his enthusiasm for the breed of horse he passionately defends against all comparisons. He neither cares too much for nor criticizes other types of horses, equitation principles or training methods. He knows what works in the medialuna, and there is not another horse in the world that he would rather be on. All the other notable characteristics about his huaso identity, he simply sees as part of the deserving tribute to the members of this little horse breed that so willingly gives him their all.